In the early Sixties, Chrysler launched an attempt to enter the UK psv market, using the Dodge name. The chassis was placed in the "medium duty" category, heavier than a Bedford/Thames, for example, whilst lighter than the AEC/Leyland range. A Leyland engine was planned for the chassis. In 1964, after they had changed the specification several times, Charles Rickards of Brentford took delivery of five of the S307/190T model, which had Perkins 6.354 diesel engines, which, together with higher-geared rear axles and five-speed gearboxes, were to give the vehicles a top speed of over 70 mph. The engine was mounted at the front of the vehicle, although the front axle was set back to provide an entrance ahead of the front wheels. They were designed for medium-distance touring, although they seemed to spend a lot of time on sightseeing duties in and around London, frequenting Hampton Court Palace quite a lot. This view shows one on duty around Heathrow Airport, possibly in later years.. The C42F body was by Strachans, some of the last bodies they produced. They seemed to have novel opening windows. Only one other Dodge coach chassis was built, an S308 demonstrator, with a Leyland engine and a Weymann body. Remarkably similar to post Topaz MCW coach body – especially the front. The fact that they share the BET screen adds to this impression – as do a slightly unfocussed frontal treatment and the plain, "honest box" overall style. It is nowhere near ugly; it simply doesn’t thrill! I was at Rickards from 1965 and seem to remember the Dodges’ as pretty reliable but a bit noisy and so they were kept on the service from the British Eagle terminal at Knightsbridge to Heathrow as the guides complained about the engine noise when used on sightseeing tours. They were repainted in British Eagle livery for this work, Rickards being part of the same group at the time. One of their successful designs was the Pacemaker, which sold in modest numbers around the country. Those AEC Swift/Merlins which lasted with London Transport (usually the ones modified to become Red Arrows) served a term of about 15 years and the bodies are reported to have been well-made. With only six of the Dodges built, it would have been a miracle to see one, but I wish I had! It maybe that the bodies do lack the ‘look-back’ factor, but I admire their clean lines, all very parallel! Does anyone have a record of their later lives, and that of the demonstrator? David, I’m not sure which MCW coach body you’re referring to. This one, http://tinyurl.com/lhn8bse called the Metropolitan, has a front dome which is identical to the Strachans body, but uses a single-curvature windscreen instead of the BET unit. Strangely, production of the last 10 of these Metropolitans was subcontracted to Strachans. There would have been more but the orders dried up. Strachans reputation was patchy to say the least, especially on the double deck front. But as you say, the Swift/Merlins were very well thought of, and the same was true of the Panthers they built for Sunderland (the Panther using the same chassis frame as the Swift/Merlin of course). Yes I did mean the Metropolitan. I think if you look closely, it is the same screen. Strachans also built a lot of bodies on Bedford SB chassis, for the armed forces, which were long-lasting. But others, as Peter W mentions, were not of good quality. Thx, John H, for some insight into the characteristics of these vehicles. Maybe the Perkins engines, rather than the planned Leyland ones were noisier in operation. One would have thought that more engine insulation was achievable. The pioneer production chassis with front engine and set back front axle, at least in Britain, was the Maudslay SF40 of 1934 which achieved quite reasonable sales until production was halted by WW2. The petrol engined version was more satisfactory than the diesel options, which employed the heavier and bulkier Gardner 4LW or 5LW, neither of which offered great refinement or dazzling road performance. Post war, the same concept was revived in the Guy Wulfrunian, which suffered by having the physically large Gardner 6LX cantilevered forward of the front wheels. All the other manufacturers who adopted the same design principle opted to reduce the load on the front axle by fitting small, high revving engines in the overhang. Bedford, Ford and Seddon, and Volvo with the Ailsa ‘decker, all followed this course. The very basic US Blue Bird school bus, sometimes seen around US air bases in Britain, is probably the most commercially successful example of the concept. The lightweight Dodge S306 (Leyland O.370) and S307 (Perkins 6.354) of 1962 were the first proper psv chassis to come from the Kew factory, and some thought seemed to have gone into the design which offered vacuum- or air-hydraulic operation of the braking system, and a five speed constant mesh (later synchromesh) gearbox. The drawbacks proved to be the very constricted front entrance steps, the awkward gear lever arrangement inherent in the mounting of a gearbox directly behind the front engine, but, most importantly, the high noise level within the vehicle. The O.370 was by no means a quiet engine, but the Perkins 6.354 was raucous in the extreme, and no amount of engine cover padding could have muffled its din. 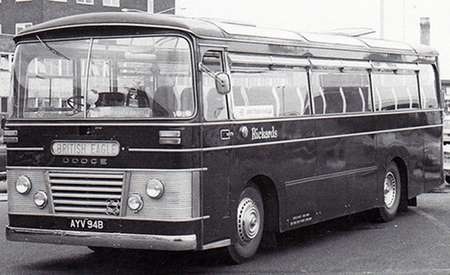 Most of the limited sales of Dodges were bodied as buses, but, as Chris has shown, Rickards did take some as coaches. I can well appreciate that they were not popular in such a role. Dodge withdrew the S306/S307 from the market in 1967. The side windows in these Strachans bodies appear to be of the ‘Auster’ type, which Aldershot & District fitted to the front upper deck windows of its Lolines. These were hopper windows which had the upper half permanently fixed outwards at about 45 degrees, and the lower part could be pulled inwards from the closed position through about 90 degrees to regulate the degree of ventilation. They worked well at the front of a double decker; I cannot believe that they were truly effective as fitted in the coach bodies shown. The side vent windows certainly look like the Auster product and look to be pairs of the standard vent per bay. Very similar to the vents on the BMMO C5. Thx, Roger, for the very interesting and informative information. I’ve always had a soft spot for the Maudslay SF40, which always seemed to have wonderful art deco bodies, the image only spoilt by the obvious starting handle! When you look at the photo of the Dodge, you can see how narrow the door seems to be and imagine how tortuous the steps must have been to get around the engine bulge. 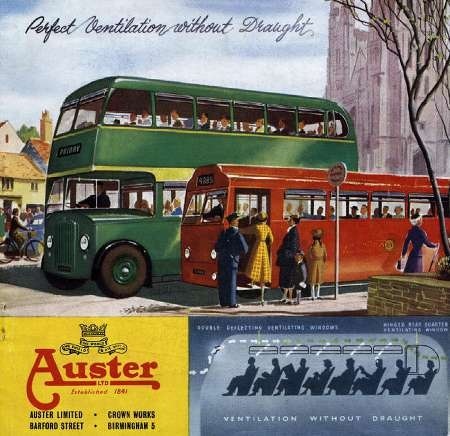 I’d never heard of the Auster draughtproof windows, but here is a 1955 advert illustrating how they were supposed to work. I wonder if the company was part of the aircraft factory. On the C5, Phil, the angled Auster windows are sort-of replicated by shape by the windscreen angles. Thx, John L, and second half of the Auster TRIPLEX name is very well-known. Chris Hebron queries the possibility of a link between the Auster vent manufacturer and the aircraft manufacturer. The only link could be that the former may (and I can find no proof that it did or did not) have supplied screens or locks to the latter. The Auster Company of Birmingham was founded in 1841 and was eventually incorporated in 1897. From the early 1900s they made a variety of screens, vents, axles, motor and coach fittings springs and other ironwork, mostly for the automotive industry. In 1937 it went into aircraft parts making windscreens, cockpit covers and other parts and continued in this endeavour during WW2. The Auster Aircraft company started life in 1938 as Taylorcraft Aircraft (England) Ltd at Thurmaston, Leicester, building licenced copies of the American Taylorcraft designs. Widely used as observation aircraft by the RAF and Army and Canadian Forces during and after WW2 the company’s UK products became one of the leading UK suppliers of private light aircraft post war, in part due to import restrictions on foreign built aircraft. With a manufacturing plant at Syston and final assembly at Rearsby the company built over 1600 aircraft during WW2. On March 7 1946 the name of the company was changed to Auster Aircraft and production was transferred to Rearsby. The company became part of Beagle Aircraft in 1960 when Pressed Steel Company took over Auster and Miles Aircraft. The Rearsby facility became Beagle-Auster, the Miles facility at Shoreham became Beagle-Miles. In 1965 Beagle was taken over by the British Motor Corporation which immediately sought finance from the UK government which bought the company in 1966. After various attempts to gain a solid market, the company was dissolved in 1969. Many Austers are still on the British register and the Beagle Bulldog, which first flew just as the company was being dissolved and was later manufactured by Scottish Aviation and then BAe, became a reasonable success selling 320 copies mainly to air forces. Last built in 1976 a number remain in military service and a few fly as private aircraft. The relationship between BMC and liquidation will not be lost here, although in 1969 the worst was yet to be…. I have been reading the article on Dodge/Strachans vehicles, which claims only 6 built including a demo, I have 6 with Rickards? Used on British Eagle contracts. I remember seeing these on day trips to Margate. Can anyone tell me what registration was the elusive Demonstrator S308 mentioned in the text? Photo credit of AYV 84B I believe should go to Steve Vallance coach and bus, an uncropped view is on facebook. Thx for clarifying the Auster Aircraft situation, Phil. From Ron’s info (thx) it’s intriguing that the number of seats went down and down for the last vehicles. One wonders if this was an attempt to ease the entrance congestion, or maybe to get the front passengers away from the noise!!! Incidentally, my photo was bought at a bus rally a couple of years ago, with a blank reverse. Pleased to read Ron’s comment that he thought there were 6 Dodges. I too was thinking there were 6, not 5, but putting it down to a ‘senior moment’! I’m unusually late to this conversation, even by my own standards – but I hope the following might still be of interest . . . the fact that it’s so tardy might give a clue as just how difficult it is to gather information about London’s coach operators. Charles Rickards (Tours) Ltd business was originally in the provision of sightseeing tours, since 1946 these were marketed as "Universal Sightseeing Tours" after the company of that name (founded 1933) was taken over. Subsequently transfer services between Heathrow and central London were operated for a number of airlines: at differing times services were provided for Aerolineas Argentinas, British Eagle, Loftleidir Airways, PanAm, TWA, and United Arab Airlines – the last transfer services (for PanAm and TWA, to Victoria) ceased in November 1981). Rail-Air Link services were developed, in conjunction with British Railways, from 1963, when a service was established between Heathrow and High Wycombe; subsequently services were provided to Woking and Watford (a service to Reading being provided by Thames Valley). It was the development of operations based on Heathrow Airport that led, in 1965, to the offices and garage being moved to Glenhurst Road, Brentford from Paddington. In 1965 ownership of Rickards was acquired by British Eagle International Airlines, one of the principal independent UK scheduled airlines of that time. British Eagle wished to provide its passengers with an improved service between its London terminal at Knightsbridge and Heathrow – ownership of Rickards would provide a competitive edge over rival airlines. A number of Rickards coaches (c17% fleet strength) were painted in the British Eagle colours of red/grey/black – around 9000 journeys were made per week on the British Eagle transfer services. 1967 was not a good year for the UK airline industry: the Arab-Israeli "Six Day War", a military coup in Greece, Spanish tightening of border restrictions on Gibraltar, and a 15% reduction in the valuation of the pound, all conspired against the airline industry by reducing the demand for international travel – as part of an all-round belt tightening British Eagle disposed of its Rickards subsidiary to Frames’ Tours Ltd in 1967. British Eagle ceased trading in November 1968. Frames’ business was largely British and continental extended tours, with around 95% of clients being from overseas (the overwhelming majority from the USA and Canada) – Rickards operations, Heathrow-London transfers and day-tours, must have seemed a good addition. Frames’ head office was at 25-31 Tavistock Place WC1, and their garage and coach station at Herbrand St WC1 – Frames utilised the basement whilst Daimler Hire Ltd (later Hertz) used the upper floors for garaging, with their work-shop being situated on the top floor. During the early 1970s a subsidiary company, Frames’ Travel (Gatwick) Ltd, operated from a base near Redhill. The Frames and Rickards businesses were merged as Frames-Rickards Ltd in 1983. Immediately prior to amalgamation the fleet strenghts were: Frames, 20 heavy-weights, all with bodies less than 5y (roughly the same fleet size as 1967); Rickards, 17 heavy-weights (four in Heathrow-Woking Rail-Air livery), 5 light-weights, and 1 mini-bus (just under a 50% reduction in fleet size since 1967, but with a similar age profile of 1-10y). The combined Frames-Rickards business was acquired by Golden Tours (founded 1984, and against whom Frames-Rickards had objected to the granting of licenses) in 2001. The Herbrand St premises were redeveloped as offices for the current occupier from 2002. Frames’ livery was originally two-tone blue, but around 1977 changed to black with red fleet-name and flag logo. Rickards’ livery was a two-tone maroon with black relief, with a Royal Warrant carried since 1936. One more can be added to the list of Dodge chassis although not an S307. In 1964 Plaxton built a dual entrance coach for Penn Overland Transport, Jamaica. It is illustrated on page 51 of "Plaxton 100 Years" (ISBN 07110 3209 2). It had Dodge chassis S305-190 8454, Plaxton C30D body 642341, and was delivered in June 1964. For the Rickards bodies on the Dodge chassis, if I remember rightly the chassis was a nightmare for body mounting. Someone who worked at Rickards may be able to comment more but I think that the chassis frame was not flat and the main rails were not parallel. As this body was more of a coach style, the stepwell needed to be as large as possible. I spent a lot of hours with Dave Hoy, the senior designer, on our knees on the full size layout tables designing the front end.